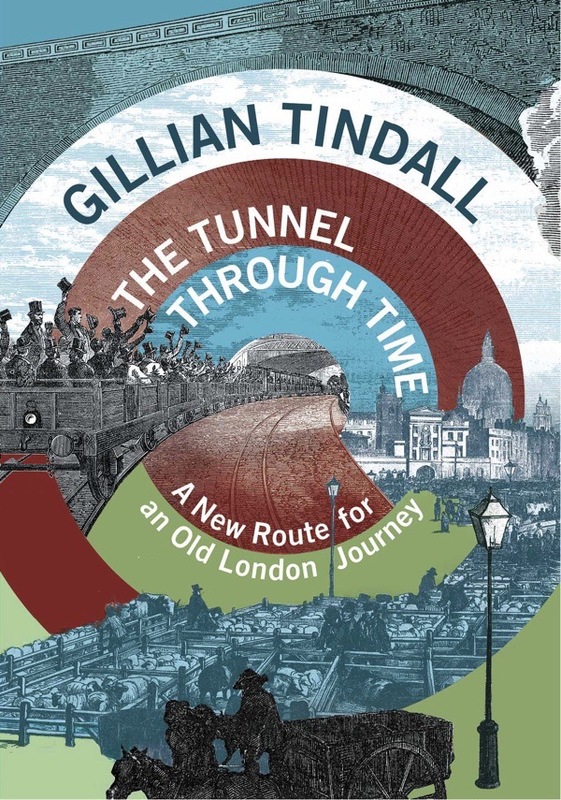 It is my delight to welcome the distinguished Novelist & Historian of London Gillian Tindall as guest author for the next week in celebration of the publication of her new book, A Tunnel Through Time, A New Route for an Old London Journey by Chatto & Windus. And thus I leave you in Gillian’s capable hands until my return on Monday 12th September. The Crossrail-Elizabeth line, through the heart of Central London and out a long way on both sides, should be fully open by the summer after next. 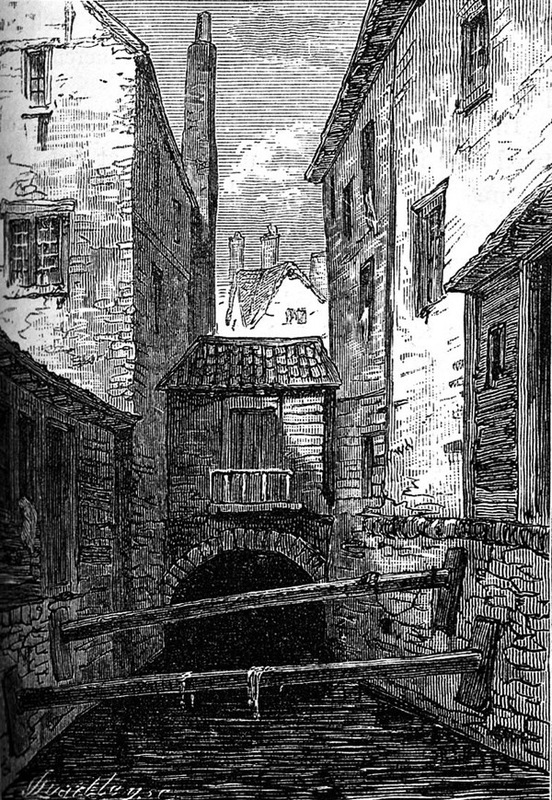 Thus, with its promise of streamlined trains and light-filled stations, one more chapter will be added to the saga of London’s subterranean passageways – yet even this part of the story is already over a hundred and fifty years old. 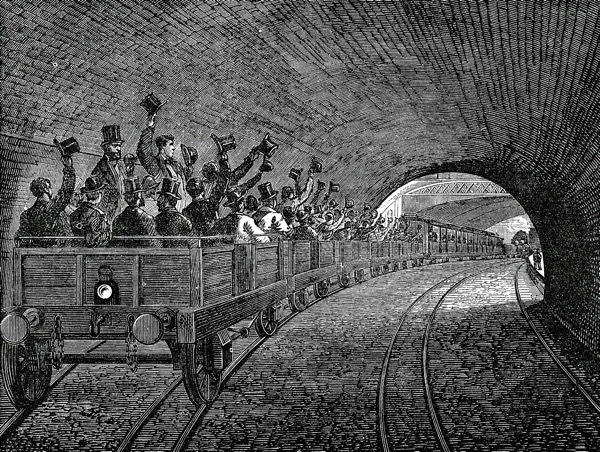 London’s first Underground railway had its ceremonial opening early in 1863. A party of top-hatted movers-&-shakers went on a trip in open wagons, and to a grand dinner on tables laid out next to the tunnel at Farringdon where the line terminated. 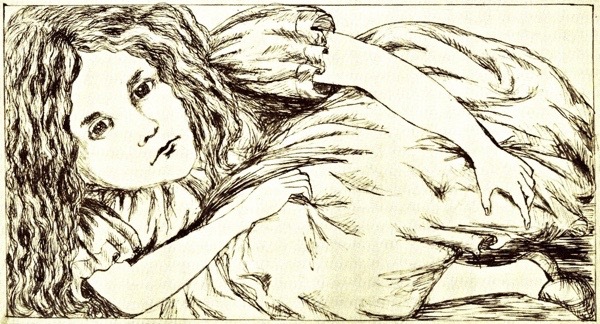 The very same month, the first manuscript version of what became Alice in Wonderland was produced, illustrated by the Lewis Carroll himself and called Alice’s Adventures Under Ground. Carroll, for all that he appeared to be a shy and unworldly academic, had tapped directly into the feeling of the times. For this first Underground – arriving long before New York’s Subway or the Paris Métro – aroused not just a lot of public interest but also anxiety. 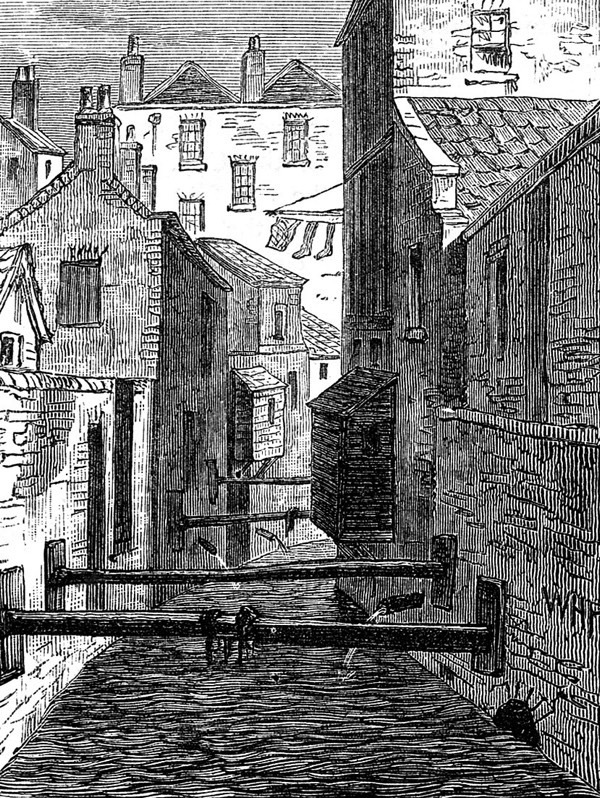 Tales of secret underground passages as routes for smugglers, criminals or escaping members of persecuted royal families, had always been the stuff of romantic and scary stories, yet railways themselves had only arrived in London over the previous twenty-five years, so they still seemed new and invasive. They also made the capital a dirtier place. 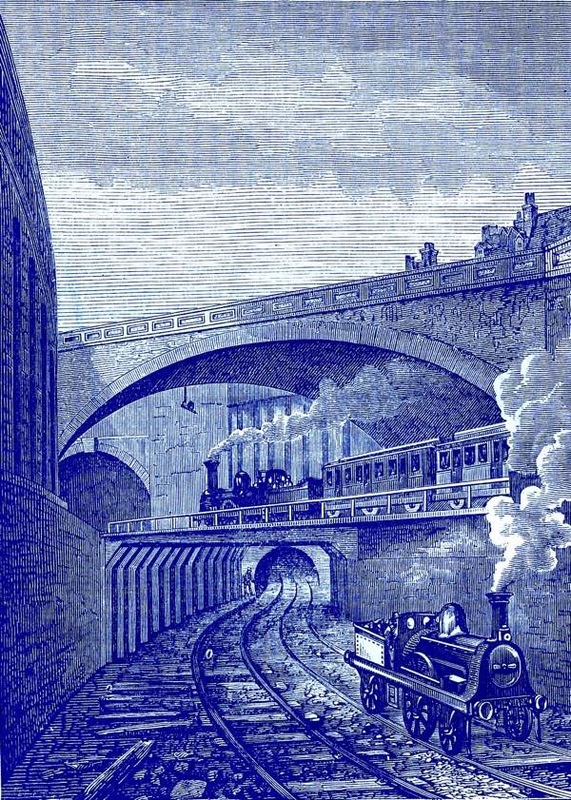 Consequently, it was not surprising the the City Corporation refused to let any of the train companies build a main station right in the centre, which is why Euston and Kings Cross, soon to be joined by St Pancras, stood glaring wistfully across the main road that separated them from Bloomsbury. Twenty years before, a railway line to and from the docks had been allowed to insert itself into Fenchurch St in the far eastern corner of the City, near the Tower, but nothing had yet been allowed in from the north. Broad St Station was soon to be built, well outside old London wall, but in 1863 no Liverpool St Station was there yet, just a terminus up at Shoreditch where the contested Bishopsgate Viaduct still stands. So the point of the new Underground line, snaking from Paddington along to Kings Cross and then down the path of the Fleet river to what became Farrington Station, was to bring trains as near as possible to the City without actually entering its fiercely-guarded square mile. This first Metropolitan Railway was the brain-child of the City’s official Solicitor, Charles Pearson, a man of advanced ideas. Its trains were, of course, to be pulled by steam engines – it would be thirty-odd years before the electric tube became a possibility – so there was no difference in kind between trains shuttling back and forth along the new line and the ones carrying passengers much further out to the north and west. The idea of City workers being able to ‘commute’ (then an unknown word) from homes in the country began as an idealistic notion in Pearson’s active imagination. The new line functioned like a branch of the main lines, diving down into a tunnel, or rather into a series of tunnels interrupted by openings to let the steam out and the air in. Unlike a modern tube, which is constructed by deep boring, it was built by cut-and-cover, with the whole area of each section laid bare for the track-laying and then roofed over again when complete. 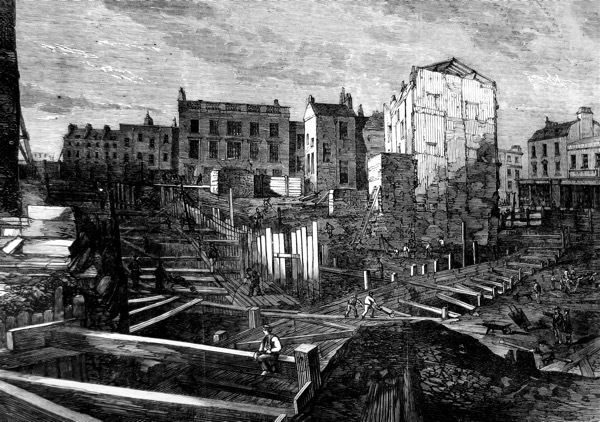 These hugely disruptive works were sited wherever possible along existing roadways, mainly along the Marylebone-Euston Rd. Most of the criticism of the line, before it opened, centred on the issue of smoke. Surely, it was said, people would be asphyxiated in the tunnels, and chemists’ shops along the route would be besieged by white-facing, gasping travellers seeking restoratives? There was also a more fundamental criticism of digging down into the earth, traditionally regarded as the domain of the Underworld. Even some clergymen joined in this fear, suggesting that the Almighty might be minded to punish both railway developers and users for such feckless, Devil-tempting behaviour. 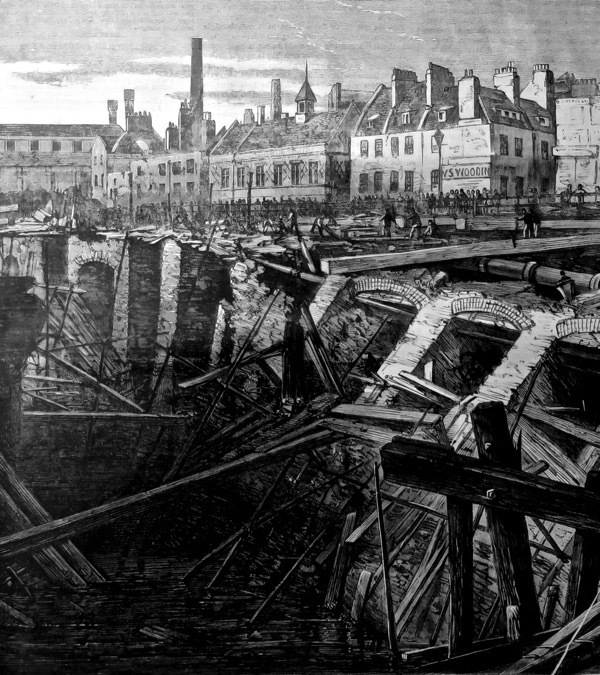 And when a shored-up embankment gave way near Farringdon six months before the line was due to open, spewing out Fleet waters mixed with dead bodies from a pauper graveyard, the religious constituency felt entirely justified. London took the Metropolitan line to its heart and, within a couple of years, the network was expanding – into what became the Circle line round inner London, and eastwards to Moorgate and Liverpool St on the same trajectory that Crossrail is taking today. 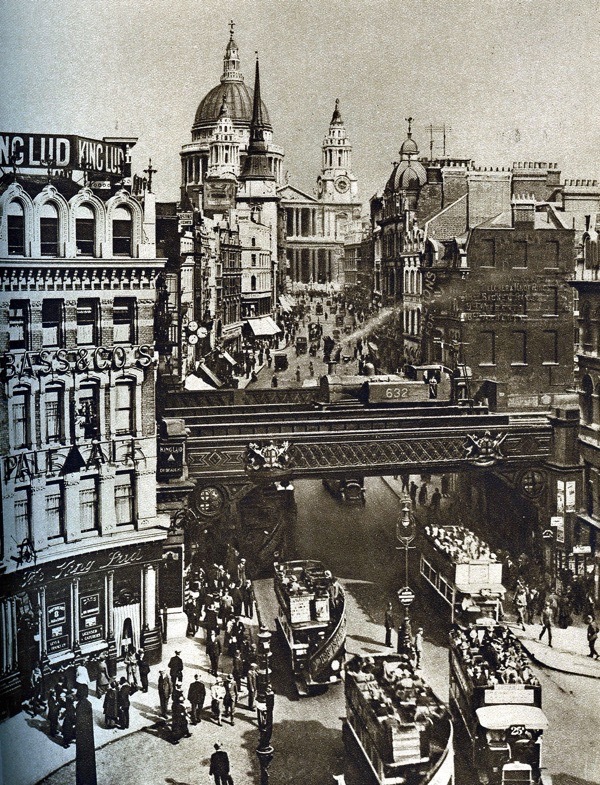 It also linked up with the London, Chatham & Dover line, London’s first ever railway, via an obtrusive viaduct across Ludgate Hill obscuring the view of St Paul’s – the viaduct remained there till 1990. The City fathers do not seem to have realised that by keeping railway stations at a distance from the sacred heart of the capital they might be creating other eyesores. Charles Pearson died just before his great project opened but, if he came back now, I think he would be delighted to see that his dream of a central interchange is at last being realised in Farringdon. For a long time, it was an old-fashioned and little-regarded station on an ageing minor line, with buddleia sprouting from its sooty walls as if the Fleet river were trying to reclaim its lost bed. Now Farringdon Station is being doubled in size to carry Crossrail as well as the north-south railway line through London to Brighton. When complete, it will offer a direct route to five different international airports – Stansted & Luton in the north, City Airport to the east, Gatwick in the south and Heathrow in the west. The narrow rabbit-hole really has turned into Wonderland, of a kind. Gillian, thanks for filling in for GA. Very interesting piece. Thank you for putting Crossrail into historical perspective and helping us to see that our ambivalence, from anxiety to eager anticipation, has many precedents! I’m sure your week of interesting pieces with equally interesting illustrations will help me not only to come to terms with its opening but positively to look forward to it! How lucky we are to have Gillian standing in for GA, and if her new book is only half as fascinating and well researched as ‘The House by the Thames’ we are all in for another treat. It will certainly be going on my wish list!! I like the dust jacket too John, a great piece of graphic designing, said she with her graphic designer’s hat on. Thanks Gillian – Great article. As you are probably aware, the part about concerns over digging into the Underworld was a theme used in the 1960s film ‘Quatermass And The Pit’ – where strange sightings are reported, during excavation of the London Underground at ‘Hobbs End’ station. Hob being an old name for the Devil! Leave it to the Gentle Author to deliver us into such good hands. The intricacy of the various illustrations made me long to know the names of the unheralded engravers. I look forward to this series, as ever. This is time travel, at its best!